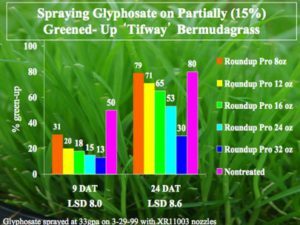 In North Carolina, application of glyphosate (Roundup, etc) has been a standard treatment for winter weed control in bermudagrass. Typically, glyphosate has been used as a “clean-up” treatment to supplement other pre-emergent or early post-emergent applications for winter weed control. Glyphosate treatment as a clean-up has been a very valuable treatment, not only for weed control, but also helping NC turf managers develop less herbicide resistance to other herbicides such as sulfonylureas, triazines, etc. Glyphosate is registered for weed control at 1 pint/acre on dormant bermudagrass. Application of glyphosate in winter is highly efficacious if applied during warm winter days (great than 60 degrees). On warm days, glyphosate uptake is greater due to more easy penetration of the herbicide via the waxy leaf cuticle. In addition, glyphosate efficacy is enhanced when applied a low spray volumes (less than 50 gpa, but 20 to 30 gpa is preferred). The first thing I remind turfgrass managers is that you will not kill bermudagrass with 1 pint/acre of glyphosate even if applied in July. However, you will see injury. So the question is, how much injury will you see if glyphosate is applied now, on a sunny 70-degree day with slightly green bermudagrass? 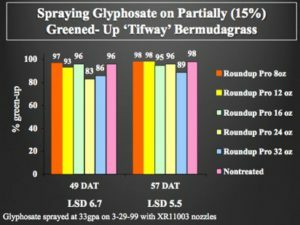 Several years ago, I did a study on this topic with glyphosate application on slightly greened-up ‘Tifway’ bermudagrass. In this study, I estimated ‘Tifway’ bermudagrass to be approximately 15% greened-up. The chart below follows green-up following various glyphostate rates applied to 15% green bermudagrass. Ratings were recorded at 9 DAT (days after treatment) and 24 DAT. Note that at 9 DAT rating, the nontreated bermuagrass was already 50% greened-up whereas 1 pt/a of glyphosate was 18%. By 24 DAT, bermudagrass was 65% greened up with 1 pt/a of glyphosate whereas the nontreated was 80% greened-up. The bottom chart follows green-up at 49 and 57 DAT. Note that the labeled rate of glyphosate (1pt/a) had caught up to the nontreated and was no longer delayed. By 57 DAT, all rates of glyphosate except the 2x rate of 1 quart/acre were as green as the nontreated plots. Spraying glyphosate on slightly greened-up bermudagrass will delay green-up. More green-up at application equals more delay in green-up. However, in my research, bermudagrass has not been permanently injured. A delay in green-up similar to the labeled rate of glyphosate in this test, is likely not going to be noticed by golfers, homeowners, or those that utilize sports fields. However, it is recommended that the area be uniformly sprayed (instead of spot sprayed). A uniform delay in green-up is much less noticeable than irregular green-up that results from spot spraying.